Just a few days removed from Wild Development Camp, Minnesota has signed defenseman Matt Dumba to a three-year, entry-level contract. The Wild’s first-round pick (7th overall) in June’s NHL Entry Draft was impressive in his first Development Camp with the team. Dumba had two of the best hits of the camp scrimmages, both occurring on Sunday after the prospects were put through a series of grueling on-and off-ice workouts throughout the week. The 17-year-old (he turns 18 on July 25) becomes the youngest player under contract with the Wild. He is still eligible to return to his junior team, the Red Deer Rebels, if he doesn’t make Minnesota’s roster this fall. With Red Deer, Dumba led all WHL defensemen in goals last season, posting 20. He also added 37 assists for 57 points in 69 games. The blueliner quarterbacked the power play, leading all Rebels with nine man-advantage goals last season. 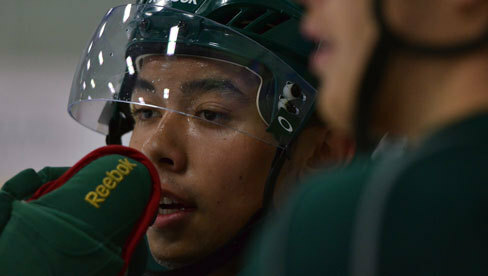 Dumba was the WHL’s Rookie of the Year in 2010-11 after he led the Rebels in rookie scoring (15-11=26). Dumba's resume is full of international experience and leadership qualities. He captained Team Canada at the 2012 Under-18 World Championships, leading the tournament in scoring with 12 points (5-7=12) in seven games, being named the Best Defenseman of the competition and leading Canada to a Bronze Medal. The 6-foot and 185-pound defender also captained Canada at the 2011 Ivan Hlinka Memorial tournament, scoring two goals and an assist in five games, leading the Canadians to the gold medal.